PennsylvAsia: Pittsburgh City Council issues proclamation on Saitama sister city relationship. 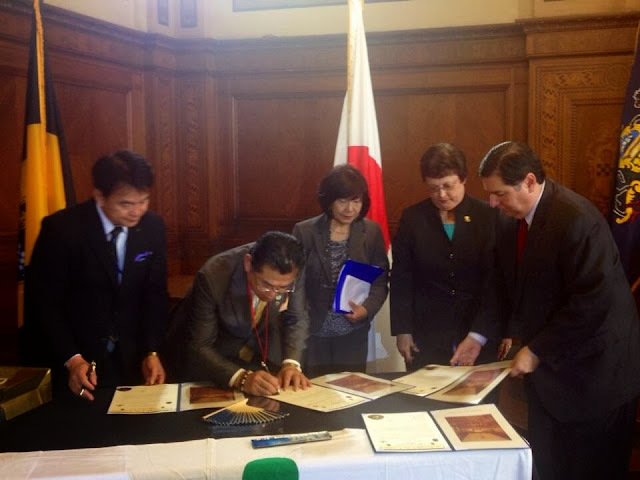 Pittsburgh City Council issues proclamation on Saitama sister city relationship. • Encourage the mutual growth and spirit of the continued Renaissance for both cities through the exchange of information and the promotion of trade and business development in the future. The City of Pittsburgh and Saitama City hereby pledge to exercise their collective best efforts to achieve the above-mentioned common goals in order to deepen the friendship between the cities’ respective citizens and governments. This agreement is hereby signed by the representatives of both cities, whose signatures appear below, in order to confirm the above accord. Winter holidays in the Pitt Nationality Rooms. Living with the Enemy author in the news. Anime Oribe, by Jeff Guerrero Ceramics. Asian films in previous 3RFFs.